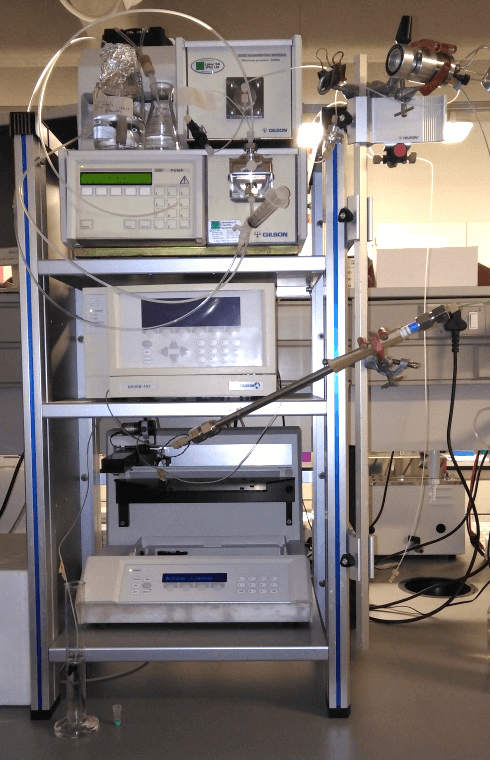 The Protein Purification Lab is run by Dr Brandon Weber, various instruments are located in the lab and can be booked after consultation with Brandon. 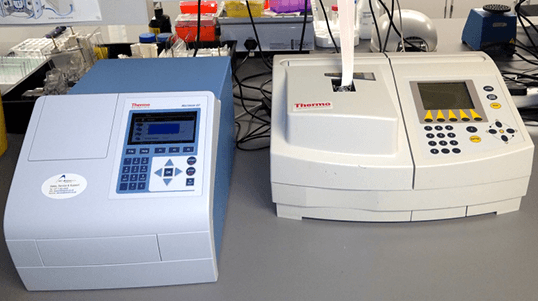 Thermo Scientific™ Multiskan™ GO Microplate Spectrophotometer allows you to perform photometric research applications such as DNA, RNA and protein analysis. The Multiskan GO plate reader features a broad wavelength range (including UV area), path length correction and a fast reading speed. In addition you can run quick measurements directly from the instrument. Helios Spectrophotometers’ superior optical system provides stability, precision and linearity. All units feature angled casing, sealed keypad to protect from spills, optional printer, plug-and-play self-aligning lamps, large LCD, VGA graphics, full-range scan displayed on-screen with peak pick-and-track facilities, choice of total control or PC-driven software, built-in methods storage, cell volume handling to 5 µL and 100% sealed optics to protect from dust and vapors. 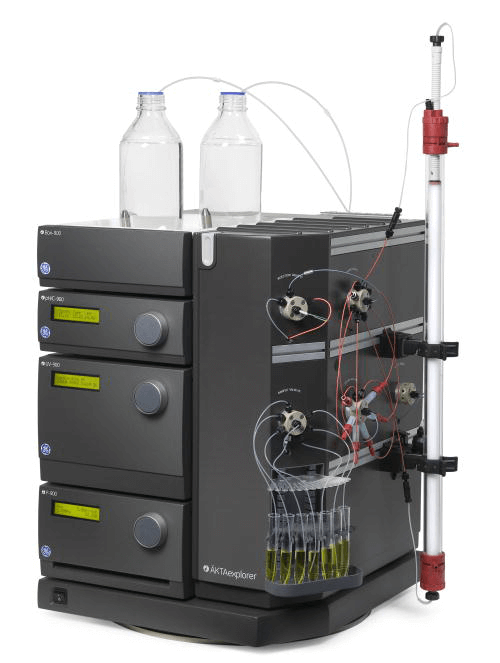 ÄKTA prime plus is a flexible system that can be used for more general purification tasks such as buffer exchange, gel filtration, ion exchange, HIC, and affinity chromatography. 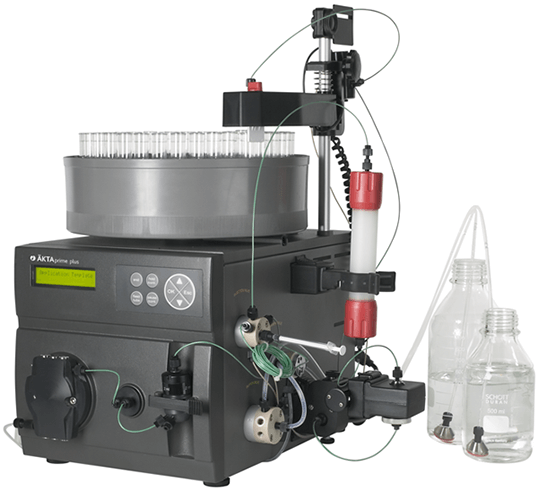 The system has preprogrammed methods for typical applications such as purification of affinity tagged proteins, MAbs, and sample clean-up. 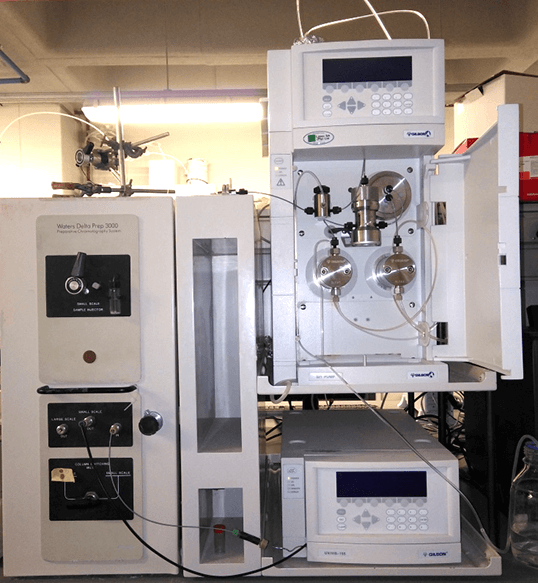 Analytical chromatography is nornally done with small amounts of material to establish the presence or measuring the relative proportions of chemical constituents in a mixture. Size-exclusion chromatography (SEC), also known as molecular sieve chromatography, is a chromatographic method in which molecules in solution are separated by their size, and in some cases molecular weight. It is usually applied to large molecules or macromolecular complexes such as proteins and industrial polymers. Size-exclusion chromatography (SEC), also known as molecular sieve chromatography, is a chromatographic method in which molecules in solution are separated by their size, and in some cases molecular weight. It is usually applied to large molecules or macromolecular complexes such as proteins and industrial polymers. 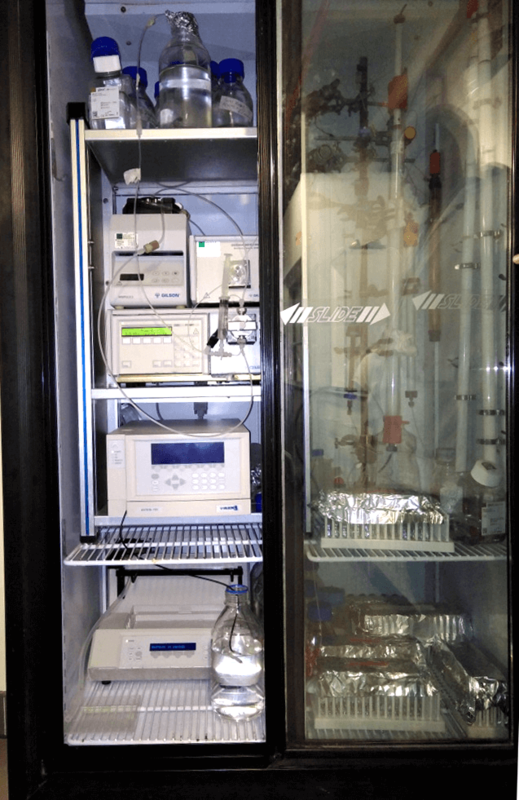 Some proteins are temperature sensitive, so in order to maintain protein stability, we have a chromatography system in a fridge which maintains the samples at a constant low temperature.